What’s up, Nomsters! We love fried chicken. It’s no secret. We’re willing to bet you do, too. Well, if you live in the Bay Area and haven’t been to Starbird, you’re not fried chicken-ing correctly. They’re probably mostly known for their sandwiches, but they have a whole range of nomtastic goodness on their menu. They have locations in Foster City and Sunnyvale, so no matter where you are in the Bay, Starbird is just a short drive away. Are you hungry yet? Let’s just jump into it! One of the newest additions to grace the Starbird menu is the Hot Nashville Fried Chicken Sandwich. This one is definitely a must try! It’s so full of flavor, and whatever the combination of spices they use on the fried chicken is spot on. The outside of the chicken is nice and crispy while the inside is moist and tender, which is SO key because nothing is worse than dry fried chicken. The only thing I, Personally, wished was different was the spice level of the chicken. I really enjoy spicy food, so I felt like they could bring a little more heat. These, right here, are Starbird’s bread and butter, and understandably so. On the left is the Big Star sandwich, which is made up of their signature crispy chicken, sliced tomato, shredded lettuce, dill pickles, and Star sauce. 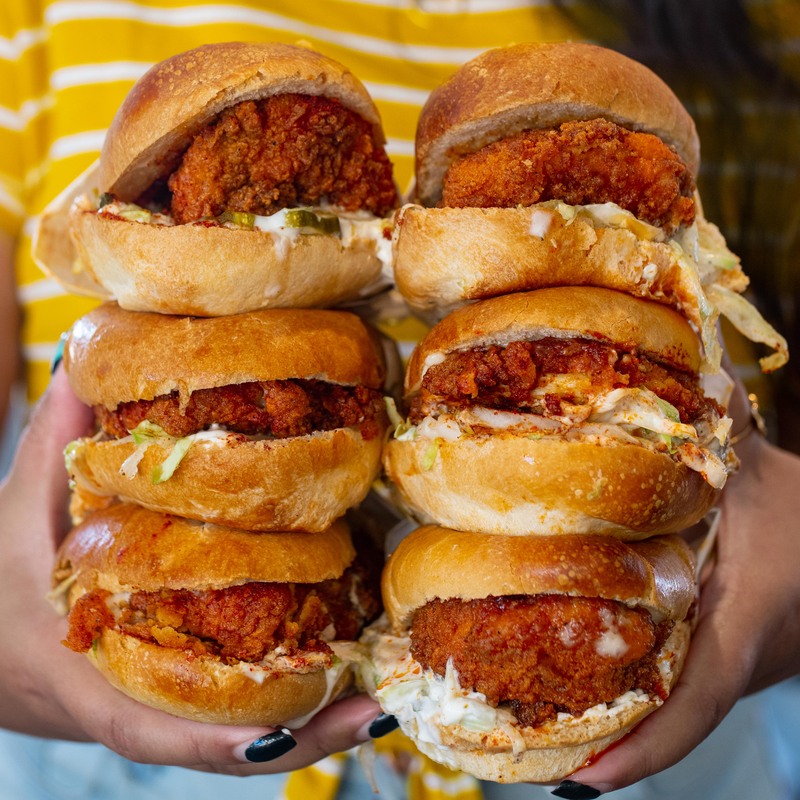 Then, the beauty in the middle is their rendition of a Banh Mi, which includes their crispy chicken, pickled carrots, cucumbers, jalapenos, cilantro, five spice, and sriracha mayo. Finally, on the right is their trusty Starbird sandwich, which is layered with their crispy chicken, super slaw, avocado, and mayo. You should try all of them at some point, but if you can only get one, I would totally recommend the Banh Mi. 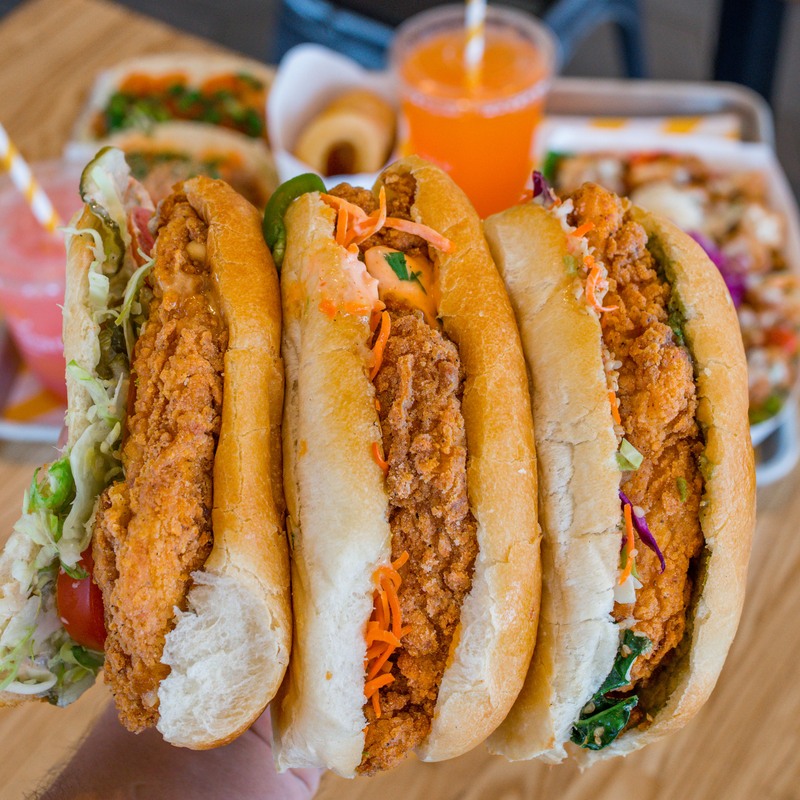 I’m a huge fan of traditional banh mi sandwiches, and it was such a unique experience to throw some fried chicken in there with all those flavors. No matter if you’ve had a banh mi before or not, give this one a shot. 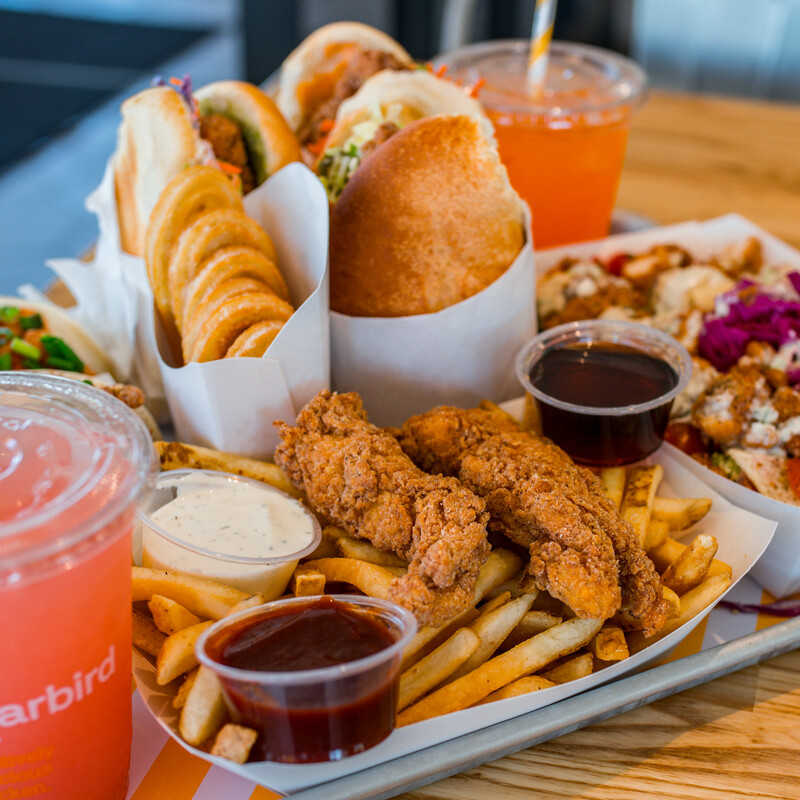 If the Vietnamese flavors aren’t your thing, definitely get yourself a Starbird sandwich. The avocado with the fried chicken is two thumbs straight up! If you’re not feeling like a sandwich, Starbird still has you covered. 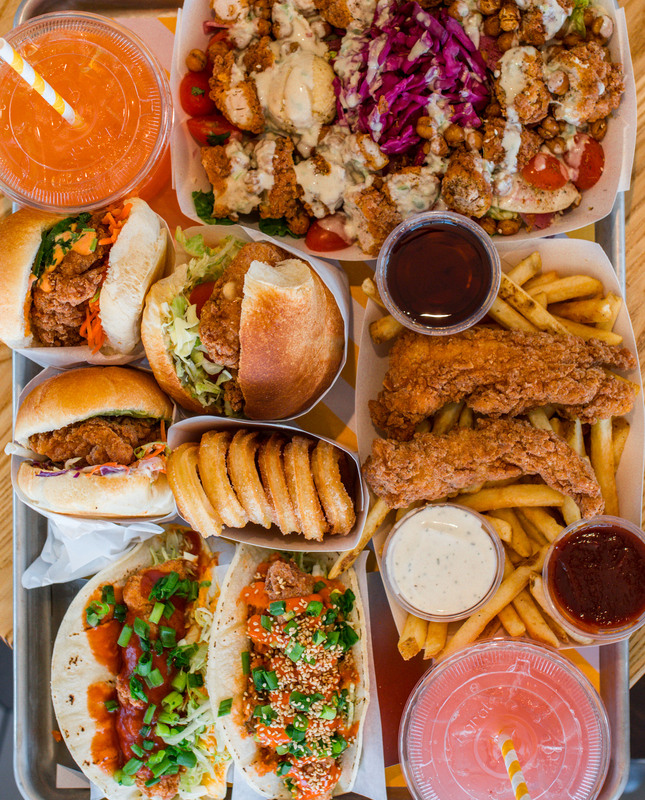 Grab some of their tenders and you get all that fried chicken goodness with some of their bomb dipping sauces. I suggest pairing them with some fries to make sure you leave with a full stomach. One of the other unique sides you should try is the Waffles Sticks, which are kind of like mini churros sprinkled with sugar and dipped in maple syrup. They can balance out the savoriness of the rest of the meal and are super tasty! Adding to the uniqueness of the Starbird menu, they even make some off-the-chain tacos using their fried chicken! 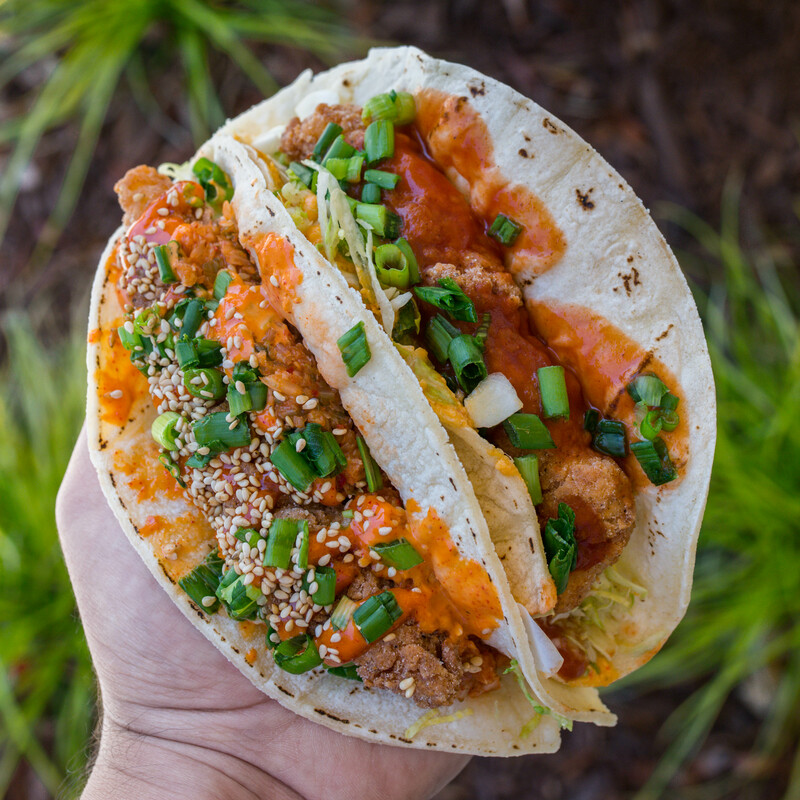 The first one you need to try is the Seoul Mate Taco, which consists of their crispy chicken, tangy slaw, kimchi, sesame seeds, and sweet and spicy Seoul sauce. The sweet and spicy sauce is so good, and like their Banh Mi, I love how they’ve fused some Asian flavors with fried chicken. AND it’s a taco! So much fusion in all the best ways. Last, but definitely not least, was the Senor Baja Taco, which includes their crispy chicken, tangy slaw, pimento cheese, green onions, and taco sauce. This one tasted a bit more like a familiar taco, but again, the fried chicken adds a whole different dynamic, texture, and taste. SEE ALSO: Chick'n Rice: Thai Street Food in Berkeley! Starbird is such an awesome experience all around, and even the staff was friendly and super helpful. Try them out when you get the chance and let us know what you think! Till next time, Nomsters! For more awesome SF Bay Area recommendations, check out our Bay Area tab HERE!